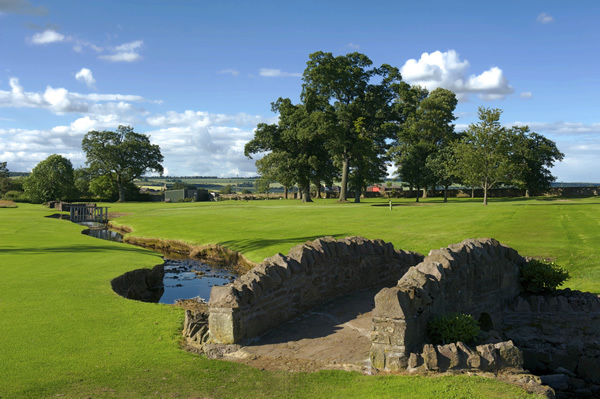 "Dunning Golf Club provides a quality golfing experience to all its members and visitors within a friendly and welcoming environment"
We are located in the very heart of Scottish golfing country. Situated right in the centre of the village of Dunning, the Club offers some of the most spectacular views of the nearby Ochil Hills. The parkland course has two sets of Medal tees for a demanding 18 hole experience and receives regular praise from all visitors for its continued outstanding condition. The Dunning burn meanders through the course providing an additional challenge to this Par 66, 4894 yard course for golfers of all levels. The new Pavilion, completed in 2010, has made the Club a very popular venue for both members and visitors alike. In the past few years, we have seen an extensive upgrading of the course with new tees, new signage, some new bunkers and the creation of a new practice putting green. The famous Dunning Tee Room - a catering partnership with two local business ladies offering a variety of high quality snacks and drinks every day. An extensive Competition schedule including the Dunning “Grand Slam of Golf”, the "Race to St Andrews" plus three invitation events. A thriving Junior section with a number of young players coming through and competing regularly in Club, Regional and National competitions. We have 3 qualified Scotland level 1 coaches. We hold at least one Open Day every year where potential members can play the course for free. This is one of many initiatives designed to encourage local golfers to join and enjoy Dunning Golf Club. NEW MEMBERS ARE ALWAYS WELCOME: Right now you can join one of Scotland's finest wee golf clubs for the 2019 membership fee of £325 pa (no joining fee). If two golfers join together, the second one pays half price - that's £243.75 each for the first year. Your new membership will be valid until February 28th 2020. Find out more on this site or just give us a call on 01764 684747. We pride ourselves in offering a friendly and welcoming environment but why not come and discover for yourself.